My mom brought these over the other day. What do you think they are? 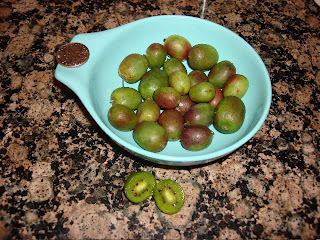 They look like olives or opaque grapes but they're actually… kiwi berries! (Note the quarter on the bowl for scale.) Each berry looks and tastes like a miniature kiwi fruit. You don't have to peel them, because there is no fuzzy skin to worry about. Kiwi berries have smooth, edible skin. These are not merely a novelty fruit. 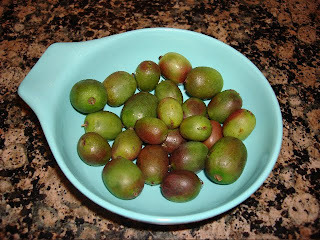 They taste great and pack the same dense nutrients that their bigger, fuzzy-skinned cousins do: antioxidants (vitamins A, B2, B6, C, E and folic acid as well as carotenoids and flavonoids), insoluble and soluble fiber, zero cholesterol, very little fat (about 1g per serving from the seeds), and a wealth of minerals (more potassium than bananas!). Plus they're cute and little, so you can coerce most kids into trying them… Roo and Jasper wolfed them down in a couple of minutes. We're going to have to look into planting one of the vines in our yard since it's apparently frost-resistant. I would imagine homegrown kiwi berries would be even more delicious! We love kiwi... Where do you get these from? I haven't seen these before. At first I thought they were mangos, based on the color. There are so many freaky fruits out there. Hmmm. I haven't ever tried them, but they sound delicious. Where did you buy them?